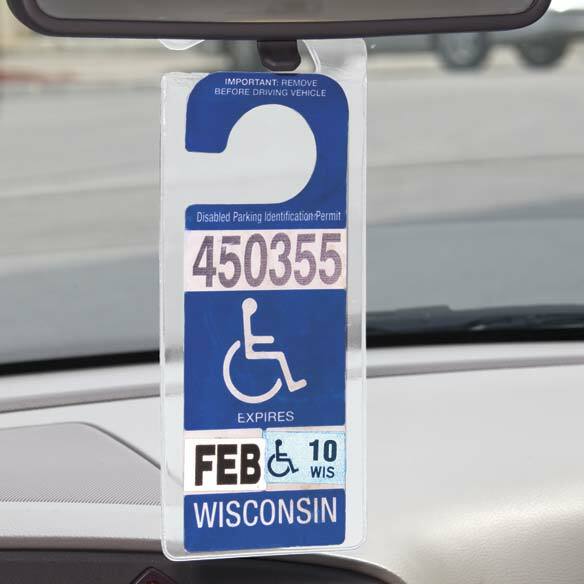 Handicap placard hanger is a sturdy plastic sleeve that protects your handicap placard or a parking pass so it won’t rip or get lost when you get in and out of the car. You won’t have to spend time and money on a replacement when you use the handicap placard protector. Clear plastic has built-in hanger; 11 1/2"x4 3/4"; fits California permits. Set of 2. Limited in walking. Parking closer to my destination is a big help for help in making my life a little easier..
no reason, is this a good choice? I have gone through several of these already because the plastic is very flimsy at the hook part and constantly breaks. I have seen this item before and have a need for it. I have a placard and think this would be good to hold the actual placard. I just got my first tag and realized I need a cover for it. I wanted a reinforced hook so the placard hook won't rip. This is a good product. It protects the paper placards from wear and tear. Easy to hang and remove. easy and good back up. Thought it might protect my card. I had another one and the hot summer sun had done its damage to my cover. This is a great idea to save placards from tearing or breaking. I have had these in the past, and they work great. My husband is a disabled vet who needs this for his placard. Wanted to buy it for someone who needs it. The first placard I purchased split at the hanger twice. The 2nd split is not reparable. I need to have a replacement plus a spare. I've ordered one before just like this and needed another one for my husband. The tab on the placard eventually breaks and this is needed. Had the protector before and loved it! Need protection; this product is wonderful recommend from friends. what is overall size of placard hangar? BEST ANSWER: Thank you for your question. It measures 11 1/2"x 4 3/4". We hope this information will be of help to you.